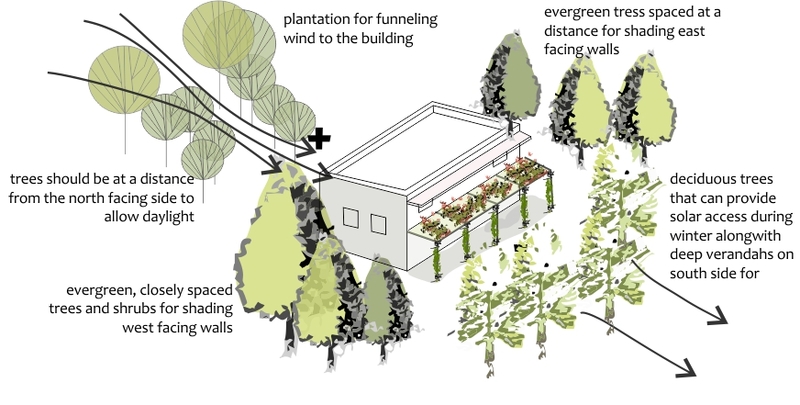 Vegetation is a flexible controller of solar and wind penetration in buildings. It reduces direct sun from striking and heating up building surfaces and lowers the outside air temperature which in turn effects the heat transfer from outside to building envelope and interior. It can also be used as internal shading element. Used as such, plants increase the shading coefficient, a measure of the efficiency of shading devices, without compromising on external views. Plants moreover grow in the direction of sunlight and the growth varies with seasons and when used keeping in mind seasonal variations at the building location, can be cost effective, flexible shading elements. Vegetation also alters the micro-climate of a site and has been used as micro-climate manager for as long as buildings have been built. This is possible through evapotranspiration. Plantation also shades building surfaces and open ground, thus inducing lower surface temperatures. Since this shading is almost permanent, the low temperatures do not vary much even when exposed to harsh radiation occasionally during hot seasons. Green roofs or roof gardens can also be used as they help to reduce heat loads in a building. The additional thickness of the growing medium provides extra thermal insulation. These also retain moisture from rainwater further cooling the roof surface. The green cover lowers ambient temperatures through evapotranspiration. Green roofs can be categorised as intensive, extensive and modular bocks. The biggest difference is with respect to the depth of soil and resultantly, the type of vegetation that can be supported in each of the types. Soil depth in intensive green roofs is at least 300mm, in extensive roofs about 25 to 125 mm, and in modular blocks about 100mm. Roof structures have to be sturdy for supporting green roofs as these impose greater dead weights than normal roofs. Proper landscape design and vegetation can be used effectively by architects from an early design phase to lower the ambient temperature and thus reducing the resulting demand for air conditioning loads in a building. Table is based on information presented in Sustainable Building Design Manual- Volume 2, by the Asia Urbs Programme and Institut Catala d’Energia. Vegetation can be used for shading, altering the microclimate and modifying the wind direction. Selecting the appropriate variety of plantation and its placement are key factors that determine how well the vegetation will serve its intended purpose. It is preferable that architects should work with existing terrain of the site, natural topography and local species for appropriate landscaping. Use of local species for vegetation is highly recommended as they are accustomed to the variations in temperature, rainfall patterns and soil conditions for that region. They are relatively low maintenance in terms of water usage, and are resistant against local pests. In addition, that also support birds and insects that thrive naturally in the region and help maintain the balance of natural flora and fauna. It is recommended that exotic species should cover no more than 25% of the landscaped area of a building. Reduce lawn area in the garden to a minimum to reduce the amount of water that is needed for irrigation. Creepers are flexible shading devices for verandahs and interior spaces. Depending on the seasonal growth patterns of creepers and timely manual pruning, these can be used effectively for controlling sun penetration. Reduce the area of hard paved surfaces through the use of polypropylene grass pavers. Absence of hard surfaces also ensures lower ambient temperature. It is also more pleasant for pedestrians to walk on a green, soft surface that does not radiate heat. Evaluate the possibility of creating “structural shading” using recycled and otherwise discarded components. Installing structural shading with a minimum Solar Reflectance Index of 29 (usually materials with light, reflective surfaces) absorbs less heat, and mitigates the probability of heat islands. Green roofs often require regular maintenance and involve high first costs; thus these have to be designed and installed carefully. The growing medium and other components add load to the roof and this extra weight has to be considered while designing the roof structure. On existing buildings, it is more feasible to either use modular blocks or extensive roof systems as these are lighter. Engineered soil that is lightweight, and has better water retention capacity and low organic content is more suitable for green roofs. Waterproofing must be installed carefully in green roofs. It is extremely difficult and expensive to repair waterproofing layers once the layers of a green roof are laid. Moreover, the waterproofing in green roofs must be elastic to withstand building movement and non-biodegradable. Plant native trees and shrubs as they are usually low maintenance. 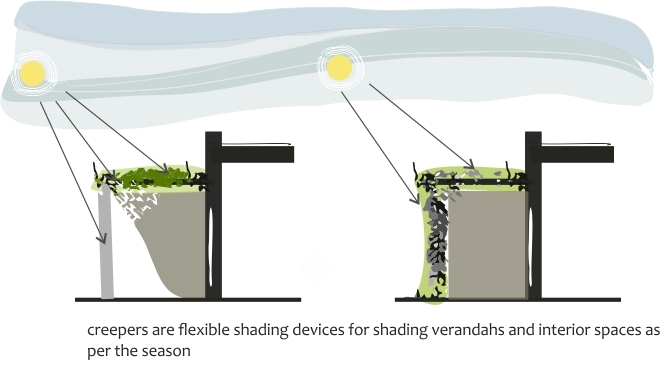 Deciduous vegetation can be considered as flexible shading devices. During winter, the vegetation will shed leaves to allow penetration of sunlight to the same occupied space which it would shade in summer. Deciduous trees are best for shading parts of the building that need sun in the winter and shade in the summer. 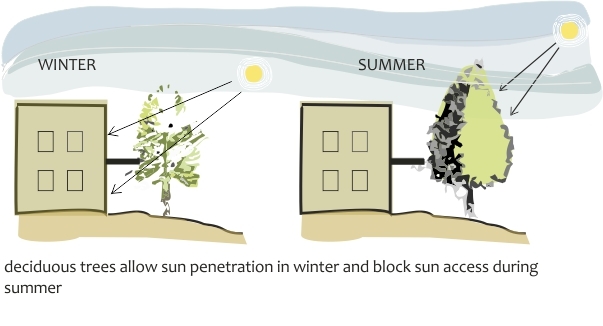 They allow sun penetration in winter and block sun access during the summer. In the northern hemisphere, deciduous trees are best for south facing facades. Plants for Passive Cooling. A. Spirn, A. Santos. Harvard Graduate School of Design, 1981. Nature Guides Common Trees of India. P. Mukherjee. World Wildlife Fund, India. 1983. Sustainable Building Design Manual- Volume 2. The Asia Urbs Programme and Institut Catala d’Energia.2004. Presence of vegetation benefits the buildings in two distinct ways. The effect of shading on the walls reduces the heat gain in the building thereby enhancing comfort and reducing energy use. Vegetation also reduces the heat gain in the surroundings of the buildings by shading the ground, parking lots, pavements, etc, which would otherwise heat up and cause urban heat island effect. Trees also reduce ambient air temperature due to evapo-transpiration. A study shows that ambient air under a tree adjacent to the wall is about 2 – 2.5°C lower than that for unshaded areas.